I often discover that those who frequently read are able to write better than their peers. Reading helps to add/improve vocabulary and improve sentence structure. You may ask why I can argue so? Based on my experience teaching younger students who were able to read faster (one at the age of 4, compared to her classmates aged 6) and teaching youths aged 12 to 16, the difference between them is the exposure to words, literacy, if you get that. Often, in school context, students are required to read for purpose(s). In the government school environment, students are required to memorize texts and information. However, this has been integrated with speaking, listening and writing elements. Reading for purpose would require finding information that will be tucked away or noted for further use. Oftentimes, college/university students find it hard to get used to this kind of reading for purpose since they would need to further explain a fact using their own opinion. Even more so when students do their thesis. The most important thing you can do to prepare for college/university may be "deep reading and reading for pleasure" - That's what Sullivan's thesis in "An Open Letter to High School Students about Reading" argued and Dr. Handelsman, A Psychology professor at University of Colorado Denver agreed with it. You may think that this only applies to college/university students but that isn't so. Reading for purpose also applies to working adults. Sometimes, they would need to prepare reports based on their understanding of the research, write emails based on the email they received and the context as well and facts that they would need to do so, speak or present using the information that they've read and so much more. So in essence, “deep reading and reading for pleasure may be the most important things you can do to prepare for college”. What you can do right now is “start to find a way right now to enjoy reading and … make it an important part of your life,” according to Sullivan. Reading for pleasure and reading for purpose may be integrated with each other. You may read for pleasure but it may be something that can be useful to you to help you further in your job or whatever task that you may need to do. In short, read with purpose(s). In order to read for different purposes, you'll need different strategies and skills. If "reading for pleasure can be quick and focused on emotions," reading for academic purposes require deep reading. 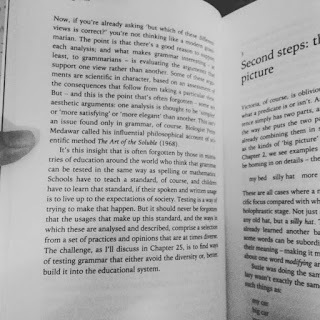 Deep reading needs to be more careful, "more slowly and more deliberately." That also means reading more than 140 characters at a time. On a side note: Dr. Handelsman also added that thinking and writing are essentially the same thing. I do agree with that. I often wrote stories as a 14-year-old and it really helped me articulate ideas as I grew up.